Yesterday, like so many days, was a whirlwind. Unlike so many days, my scheduled activities required that I fire the few cylinders left in my head. By late-afternoon, I was mentally exhausted. I mean I could barely speak. In fact, I stopped speaking altogether after leaving the very expensive, yet-healthy-and-delicious grocery store where I purchased two pounds of grass-fed, organic, locally butchered, pre-cooked meatballs from their deli case because I could not bear the idea of making dinner from scratch. But I digress. Back to the story. Small and Medium are in the midst of a tickle fight in the back seat of my car. I am trying to ignore them while I drive and daydream about beef. As I turn into our neighborhood, my cell phone rings. It is one of Large’s friends asking to set up a playdate. My carb-deprived brain stops listening when it registers that it’s seeing two escaped prisoners. I toss my phone on the passenger’s seat and slam on my brakes. My next-door neighbor’s golden retrievers are headed for adventure on the open road. They are the picture of happiness – tongues lolling and tails waving. For a long second I debate: should I let them go or try to catch them? I spring from the car whistling and calling to them. I don’t know their names. They come over to me anyway and I grab their collars. They are huge dogs. I am wearing heels. Neither dog appreciates being caught and they begin twisting and pulling to get away. I struggle to keep my balance and hang on. In this moment, I come to the instant and awful realization that with both of my hands full of furry beast, I can do nothing else. Thankfully, I am rescued by another neighbor who weighs about 100 pounds soaking wet. “Can I help?” Neighbor #2 shouts. I explain the situation. Neighbor #2 has caught the other dog again. Neighbor #4 generously offers to put the dogs in the back of her SUV. We get one dog in; the other dog runs off. Neighbor #2 chases. I tell Neighbor #4 which house to drive to and follow her, scolding my children to buckle in as we’re driving, hoping the dogs’ owner is home. I bang on my next-door neighbor’s outside breezeway door. Just when I think no one’s there, the inside breezeway door is opened by a bare-chested, pajama-panted teenage boy that I have not seen in the seven years my next-door neighbor and I have been neighbors. The teen takes one look at me, blanches, and before I can say anything, closes the door in my face. I send Medium home to get our dog leashes, then bang on the door some more, pace, and think dark thoughts about teens today. Neighbor #4 supervises her children and mine and checks her watch. Medium returns with the dog leashes and her father. We leash the dog and encourage Neighbor #4 to get going but she can’t because I unthinkingly parked behind her. I ask my husband to take Medium and our car home. “Whaat?” He acts baffled and is seemingly unable to look at me. “I didn’t know even know they were out,” he mumbles. Neighbor #2 pulls up in her car with the second dog. The teen brings the first one into the house. As he is wordlessly bringing the second dog inside, I call to him sarcastically, “Thank you!” He doesn’t respond. I need carbs. F#%k this diet. By the way, in case you’re interested, the house on the other side of ours is for sale. Stupid teenagers! I know all about them… Did you find pre-made meatballs that didn’t have breadcrumbs in them? Wait, you’re not eating carbs on purpose? weird. Doh! I never thought about the breadcrumbs! I thought I was being virtuous. Hmm. I think I may have said that before. When I was a stupid teenager. My friend, you know me well! Thank you for the brownies; they were delicious and thank you for the good company! Common courtesy really would have gone a long way. As for me, I should have reined it in. You could have pulled me off the ceiling I was so worked up afterwards. I broke my carb fast yesterday and am much more balanced today! Are you doing the actual Atkins plan (which is not a completely carbless diet) or is Husband doing his own Meatavore-challenge version? We (were) doing Atkins’ induction for a week which allows for 12-15 (I don’t even know what the unit of measurement is) vegetable sourced carbs. I savored Amy’s brownies last night along with a carb-filled glass of red wine. Delish! Are you doing the South Beach Diet? Oh boy, any food restriction is no fun! I hope you have a better day tomorrow! The South Beach Diet may be a better one for me to manage than Atkins. But I like food too much to devote myself to a permanent diet just to get to some magical number. I watched my mother struggle with her weight and she was on every fad diet known to man while I was growing up – the whole thing just made me skeptical and sad. Exercise regularly, eat everything in moderation. I’m back to my old standby. You need a CHEESECAKE! Are you serious? I would’ve flipped my lid. I’m going shopping today and looking to get you a Winner of Patience ribbon. 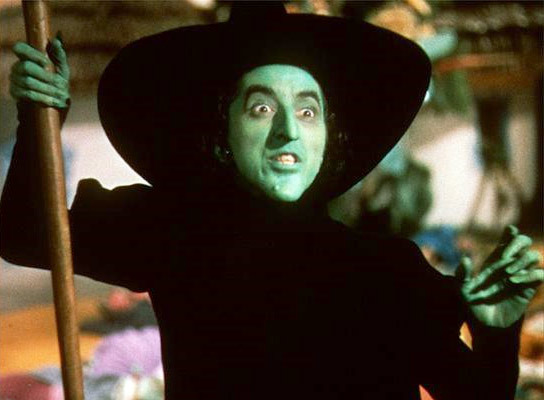 loved the picture of the Wicked Witch! Pray, Pray, Pray that our boys don’t turn out so rude! You do not need a diet Mary, lovely exactly as is!